Braised beef, carrots and onions in gravy with mashed potato. 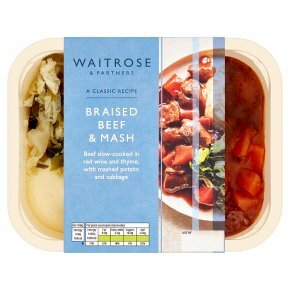 INGREDIENTS: potato, beef (28%), broccoli, carrot, onion, ale (barley), red wine (red wine, sulphur dioxide), wheat flour, unsalted butter (milk), semi skimmed milk, beef extract, tomato paste, salt, rapeseed oil, cornflour (maize starch, sulphur dioxide), beef gelatine (beef gelatine, sulphur dioxide), tomato purée, thyme, ground white pepper, ground black pepper. For allergens, including cereals containing gluten, see ingredients in bold. This product may contain sesame.